KIEV, Ukraine -- The war in Ukraine, after a long lull, is suddenly picking back up. A Monday report from the New York Times, as well as previous dispatches from the Washington Post and Reuters, concluded that the pace of the violence in eastern Ukraine's contested Donbass region has escalated since mid-February, with death tolls rivaling those of last September — just before a partial truce took hold. It's not bad as it's been in the past. According to the Times's Andrew Kramer, "Neither side has yet resorted to firing heavy artillery," for example. 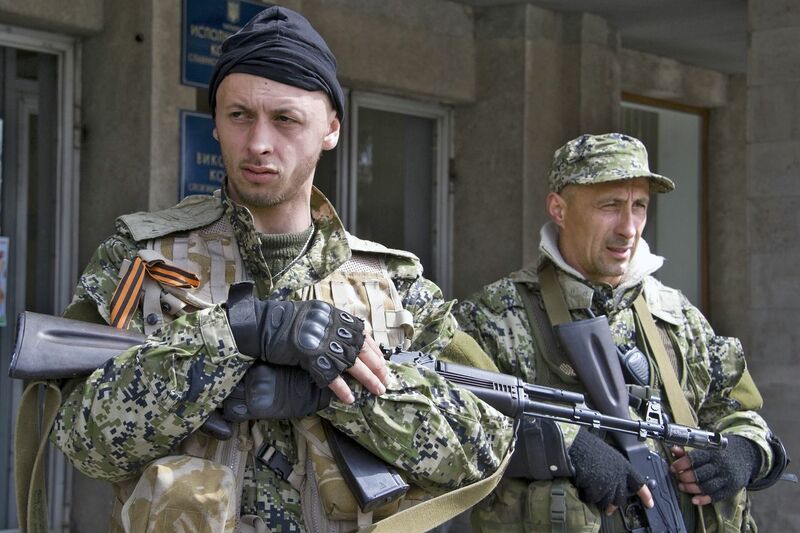 Russian-backed separatist rebels are mostly driving the increase in violence. They are probably aiming to improve their position in advance of peace negotiations. It's a reminder that Ukraine's ongoing war, mostly off the front pages, still remains quite live — and quite dangerous. A little over a year ago, Russia and Ukraine, along with France and Germany, reached an agreement meant to end the war. It's called Minsk II, named for the Belarusian capital where it was negotiated (the first Minsk agreement had collapsed in failure). The first steps were a ceasefire and the withdrawal of heavy weapons from the front lines. Between February and September 2015, Russia and its allies brazenly violated the ceasefire, even launching a major offensive aimed at the city of Debaltseve. By September, the separatists' advance had stalled. Under heavy diplomatic pressure and economic sanctions, Russia and its proxies began complying with the ceasefire and withdrawal terms. The result was not peace or an end to the conflict — far from it — but at least a welcome lull. Minsk II had also set a December 2015 deadline for reintegrating eastern Ukraine back into the rest of the country, albeit now granting the region more autonomy. But it didn't happen by the deadline and still hasn't. So France and Germany said they were pushing the deadline to an indefinite point in 2016. As all this was happening, Russia continued to arm and support the separatist militias, thus keeping the war going. And beginning in mid-February, the rebels stepped up low-level attacks, but kept the fighting short of a full-blown return to war. Analysts generally put the responsibility here on Russia, which they say is likely seeking to get the conflict going again to improve its position for the likely next round of peace talks. "All indicators point to the conclusion that Russia is not yet prepared to reach a settlement of the crisis in eastern Ukraine, at least not on terms that would be considered reasonable for Kiev," Steven Pifer, a senior fellow at the Brookings Institution, writes in a February piece. Instead, Pifer writes, it's in Russia's interest to maintain a low level of conflict — periodically escalating when it wants concessions. The most likely state in which Donbass will remain into the foreseeable future is thus a frozen (or not-so-frozen) conflict, where there is no major fighting yet no complete ceasefire, and where negotiations on implementing Minsk II continue yet show scant real progress. Ukraine may thus feel pressured to carry out its end of the Mink II agreement even as Russia does not. The Times's Kramer spoke to a Ukrainian commander, Lt. Col. Mikhailo M. Prokopiv, who suggested the fighting was meant to "give us a little nightmare" and pressure Ukrainian leaders to comply with the terms of Minsk II. In the long run, this up-and-down cycle of war in eastern Ukraine — peaks and valleys of violence — will be very costly for Ukraine, which is beset by a number of political and economic problems. "Ukrainians are becoming worn down by being held in a state of suspense over months and years — stuck between calm and tension, war and peace, insecurity and stability," Andreas Umland, a senior research fellow at the Institute for Euro-Atlantic Cooperation in Kiev, writes in an Atlantic Council piece. He continues: This tactic could eventually hollow out the territories of so-called "New Russia"—that is, southeastern Ukraine—to such a degree that they sink into isolation, depression, radicalization, and violence. According to the logic behind this approach, the region will sooner or later fall by itself into Moscow’s lap. And that is why the current round of fighting is dangerous. It strongly suggests that Russia and its proxies aren't serious about peace — and are, instead, perfectly fine with a perpetually "frozen" conflict.